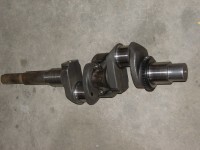 Fully reconditioned / reground crankshaft for PETTER PH2 engine supplied with set of main bearings - all ready to fit. These are professionally reground to a very high standard indeed. All gasket sets available for PH engines plus many other parts, seals, cams, gears, etc. Many good used parts too. Please ask. 1 x 0.010" mains with 0.010" big ends.